I wanted to write something totally profound and mind blowing to entice you into making these cookies, but the only thing that keeps coming to my mind is, wait for it, it's totally epic.... "Roll Out"....as in the Ludacris song, not as in "rolling out the dough". 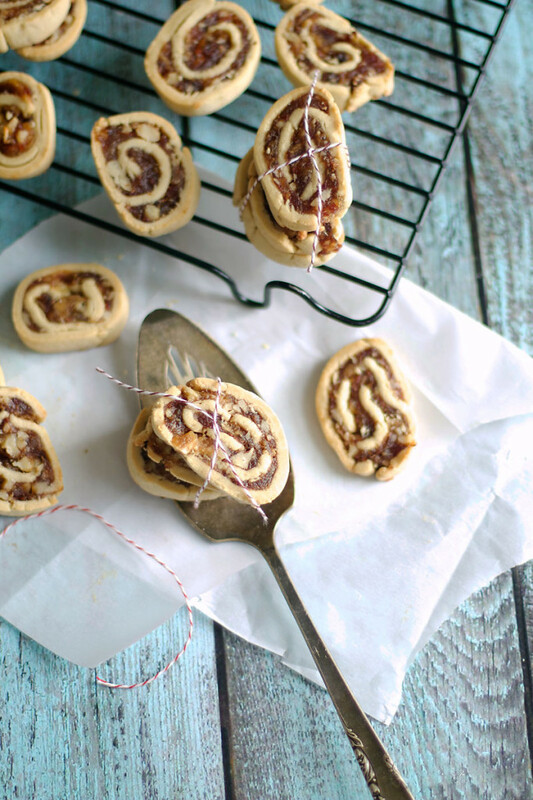 I think it came into my head as I was rolling out the dough for these pinwheel cookies, and it hasn't left my head since. That was 2 days ago. Also, it should be noted that the only lyrics in my head are "Roll out! Roll out! Roll out!" because I don't actually know any of the lyrics to the song, nor can I rap. So besides those two little words, the only thing that's stuck in a blog post that has now been written and rewritten 4 times is that I love these cookies....like a lot....a lot, a lot, a lot. But I bet you already figured that out, because weird, I only put things I love on here (funny concept, I know). 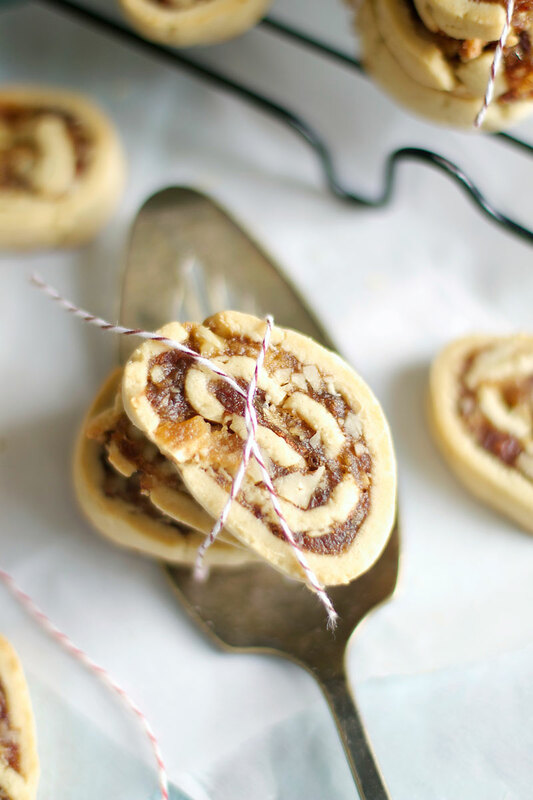 Like many of the recipes I share, these date pinwheel cookies are a recipe that my family has been making for years. And for all those years they've stayed firmly planted at the top of my list of favorite Christmas cookies, right between Russian Tea Cakes and Rum Balls. With a buttery dough that becomes crunchy while it bakes and a filling that is sticky sweet, it's hard not to put these at the top of a favorites list. Go on. I dare you. Start by making the filling. Combine the dates, water, and 1/2 cup of granulated sugar in a medium-sized saucepan. Cook over medium heat, stirring occasionally, until the mixture has thickened and the water has evaporated, about 5 minutes. Remove from the heat, stir in the nuts, and set aside to cool (you can put the mixture in the fridge to speed up the cooling). To make the dough, cream the butter and sugars together in the bowl of a stand mixer, on medium speed. Beat in the egg and vanilla until well combined. In a separate smaller bowl, sift together the dry ingredients. Then mix the dry ingredients into the butter mixture and keep mixing on medium speed until everything is well-combined and the dough is smooth. Divide the dough in half. Wrap each half in plastic wrap, then allow the dough to refrigerate for about 10 minutes. Remove the dough from the fridge. On a floured surface roll one half of the dough out into a rough rectangular shape that is about 1/4 inch thick. Spread half of the date mixture over the entire surface of the dough, then roll up, lengthwise, like a jelly roll. Set aside and repeat the process with the other half of the dough. Wrap both dough logs in plastic wrap and allow them to chill in the refrigerator until firm, at least 30 minutes. When you are ready to bake the cookies, turn the oven on to 400 degrees and line a baking sheet with parchment paper or a silpat mat (I prefer the parchment paper for these as the filling can get a bit sticky). Remove the cookie logs from the fridge and, using a sharp knife, cut the dough into 1/4 inch slices. Place the slices about an inch apart on the cookie sheet, then bake for 8-10 minutes, or until the dough turns golden brown. Remove from the oven and allow to cool on a cookie rack. I used Medjool dates to make these but I recommend using whatever is cheapest as you'll be chopping them up and cooking them down. These cookies taste best within the first two days of baking so I usually like to only slice of a few at a time and keep the rest of the dough tightly wrapped in plastic wrap in the fridge until I'm ready to use it. The uncooked dough will last about 2 weeks in the fridge and about 1 month in the freezer, as long as it is well wrapped in plastic wrap.